One day in May, my friend Danijel called me if I want to join him in visiting Dimitri Brečević, a young (30 something) winemaker from Buzet. Danijel had some guests from Lausanne, a beautiful city on the shores of Lake Geneva where we both finished our PhD (at EPFL), and these guests did not speak English. Nor Croatian or Italian. Juste le français. Luckily, Dimitri does not have problems with French like most people here do. This should not come as a surprise since his mother is from French Basque Country, more precisely from a small town Jurançon in the foothills of the Pyrenees, where he was born after all. It is a region famous for its dry or sweet (even botrytized) white wines that got royal status in the 16th century. Bordeaux, wine capital of the World, was not far away and Dimitri decided to head there to study enology. After graduation in 2002, he worked for several years in renowned wineries all over the world – Domaine de Chevalier in France, Canterbury House Winery in New Zealand, then back to Bordeaux, spring in Australia, another autumn in Burgundy… It was a valuable experience since he learned how to make wines of completely different styles, but after four years he was tired of switching hemispheres every six months. So, he decided to get into adventure of his life. In 2004 he founded his winery in Buzet, a pitoresque medieval town in the northern part of Istria. 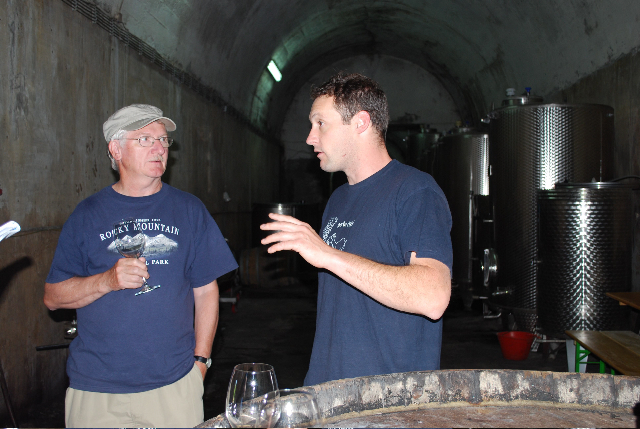 He currently produces two wines, Malvasia and Teran, to which he added commercial name Piquentum – derived from the latin name of Buzet. I wanted to get know my fatherland. You know, my father was born in Tinjan, a small village near Poreč. He returned from France few years before me and put our family house in Višnjan in order. Other reason is more professional. I realized that climate, red and white soils, everything here is perfect for quality viticulture. Then, for a while I was searching vineyards from which I could buy good quality grapes, and then in 2006 I had my first vintage. Is the climate here similar to the one in Provence? Not quite, it is not so dry and hot. You know, Istria is the northern edge of Mediterranean, and in the winter it can be very cold when the strong wind bura comes from the north. In September, when usually vintage takes place, it is chilly during the night and this helps to maintain nice acidity and aromas in the grapes. We are in front of his winery, just below the hill on which Buzet is settled. The entrance looks mysterious, like access to a top-secret underground military facility. When we entered inside the temperature dropped suddenly and it started to be chilly. Large stainless steel barrels and water drops falling from the ceiling added some Science Fiction atmosphere on the scene. Wow, what a strange building! You do not need air conditioning here? It is an old water cistern made in the 30s when Italian administration ruled here. And you are right, if the door is closed, the temperature is around 10 – 11 ºC throughout the year. For successful fermentation this is too cold so I need to use a fan that brings some air from the outside to reach 14 ºC. How do you do the fermentation? After tender pressing of grapes, the juice is left to ferment in stainless steal barrels without addition of selected yeasts. The temperature is not controlled and it is usually between 22 and 23 ºC for Malvasia. Most people here do it with the temperature between 15 and 16 ºC since they want to preserve the primary aromatics, the typical aroma of Malvasia or Teran. I am not interested in this style that has now become mainstream, instead I like wines that need more time and are able to develop nice secondary and tertiary aromas. 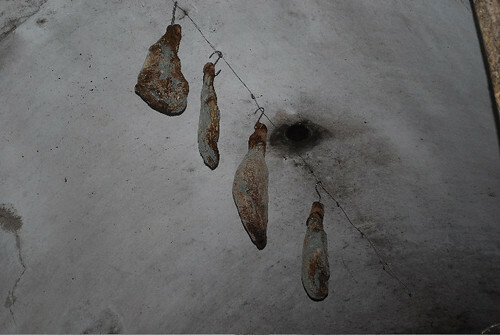 Dimitri’s produces traditional air-dried istrian ham (istarski pršut) just for his family. Note how the skin is removed, and the surface is covered by a layer of pepper and noble mold. Clai and Roxanich also do not add foreign yeast during the fermentation of Malvasia but they leave juice in contact with the skin for several weeks. Instead, you ferment only the juice. Do you have problems to extract enough yeast from the grapes? It is true, it is much easier to extract it using the maceration. But, if you press the grapes slow enough the juice will flush the skins and there will be enough yeast to start a good fermentation. The larges part of grapes is not your own production. What do you demand from the grapegrowers? First, the vineyard should be treated only with products based on copper and sulfur. In fact, more sulfur and not so much copper, so that enough yeast remains on the skin. Then, I want that the yield per vine is around 1 kg, but I can only dream about it. People promise you something, but then you find more than 4 kg. For Malvasia that is not so critical, the wine will still be decent enough. But Teran is more demanding. That is why I started to buy some vineyards, and plant new ones, so that I have full control over grape quality. My dream is to produce wine exclusively from my own vineyards. How the vineyard should be planted and how do you get such a low yield? The vines should be densely planted, one plant per 1 m2. In that way you promote competition between the plants in a sense that they become forced to search for water deep in the soil. The roots become longer, they go deeper and hence provide more minerals to the plant. The beautiful thing is that this can be felt in the final product, the wine has more extract and minerals, it becomes expression of terroir. To get such a low yield I prefer to prune the vines before the start of the vegetation so that the plant does not spend too much energy on growing branches that will be thrown away at the end. Apart from Malvasia and Teran/Refosco, do you plan to introduce some international varieties? No. I believe in these traditional Istrian vines, here they can give excellent results. I am especially fond of Teran. If in the next few years I manage to go down with the yield to 1 kg per vine I will get enough extract to soften its spiky acidity. I am thrilled to see what will happen. The end of our interesting journey was marked with excellent 2007 Refošk made from 100% Refosco (a close cousin of Teran), now resting in a barrique. This wine is Dimitri’s experiment that is still not on the market (too bad!). It is very similar to Teran, but less rustic, aroma is more fruity and complex, acidity is less pronounced, in mouth is very smooth, of long finish and of great aging potential. 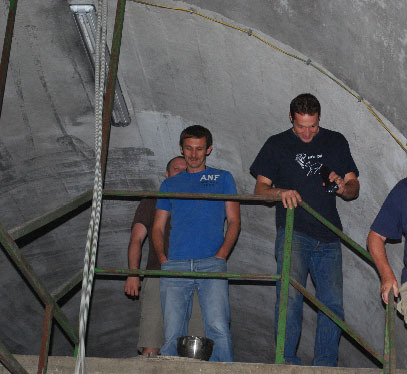 Before we left, Dimitri invited us to the opening of his wine tasting room that will be finished in few months and settled three meters above the ground, just under the ceiling of the cister. Many thanks to Dimitri for his warm hospitality, knowledge and ideas he was willing to share with us. I am looking forward to come back and see what’s new! 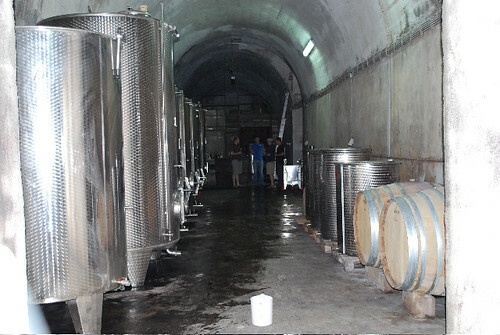 Fascinating report Goran- I could almost taste the wines…maybe one day! Good luck to Dimitri! Thanks Amanda! You have probably read the post because you have a French in your house 🙂 Would be nice to see you, Gérard and the baby here in Istria. Take care and a big hug.